Adaptable, Advanced Integrity. 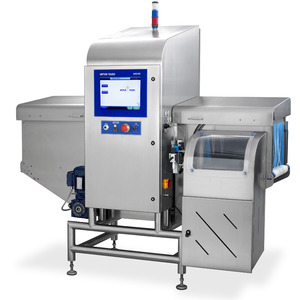 Highly configurable, the X36 offers the highest level of integrity checks across multiple product lanes at high throughput rates for complete brand protection and compliance. Providing the highest level of contamination detection while performing product integrity checks, offering outstanding product safety and quality. 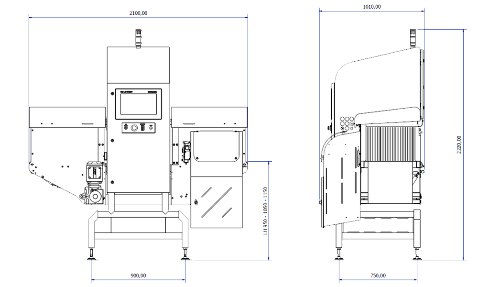 The X36 is a flexible x-ray solution that can be integrated into an existing production line inspecting multiple product lines with just one system. Full resolution inspection software and imaging capabilities ensure continuous optimum detection sensitivity irrespective of throughput rate. Our experienced market-leading x-ray engineers can customize the X36 to suit individual applications to ensure brand protection and enable business growth. The X-ray Software conducts a full range of integrity examinations in real-time and removes substandard products from the line to uphold brand reputation. A low powered x-ray generator delivers equal or greater detection sensitivity, utilizing only 1/5th of the energy than traditional solutions on the market, reducing TCO. All x-ray generators have a 5-year warranty, when a standard or comprehensive service contract is purchased. A global network of service engineers are on-hand to guide manufacturers how to optimize the performance of the X36 and reduce the effects of unscheduled downtime through supporting clients locally. The X36 Series encapsulates the most advanced development in x-ray imaging technology on the market with a full set of inspection tools, providing outstanding detection sensitivity for contamination detection and product integrity checks.The X36 is designed to customers’ expectations offering single and multi-lane inspection. The X36 Series has a full set of inspection tools, providing outstanding detection sensitivity for contamination detection and product integrity checks. Designed to customers’ expectations offering single and multi-lane inspection. This application video is split into multiple stages, showcasing the ease of logging into the x-ray inspection system, choosing a new product in seconds, multiple lane inspection followed by viewing reports on the x-ray systems screen. A full set of inspection tools, providing outstanding sensitivity for contamination detection. Safeline X-ray is not just manufacturing x-ray systems for product inspection. We are also the global leader in designing the most advanced and most adaptable x-ray technology on the market. This short video will introduce you to our facility in the UK where we meet our customers, test products, develop and design innovative x-ray solutions to suit our customer needs.